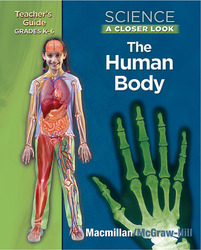 Macmillan/McGraw-Hill's The Human Body series helps you address standards by providing instruction on the human body, its systems, structures, and functions. Included are hands-on activities about the body and health-related information related to each system. Specific goals of state science standards are supported. This single-volume Teacher Guide supports all three Student Editions, Grades K-2, 3-4, and 5-6.